In 2009 the Tactical Medic Police Officers and Special Operations Combat Medics of OSS created the first and only pocket gunshot survival pack. 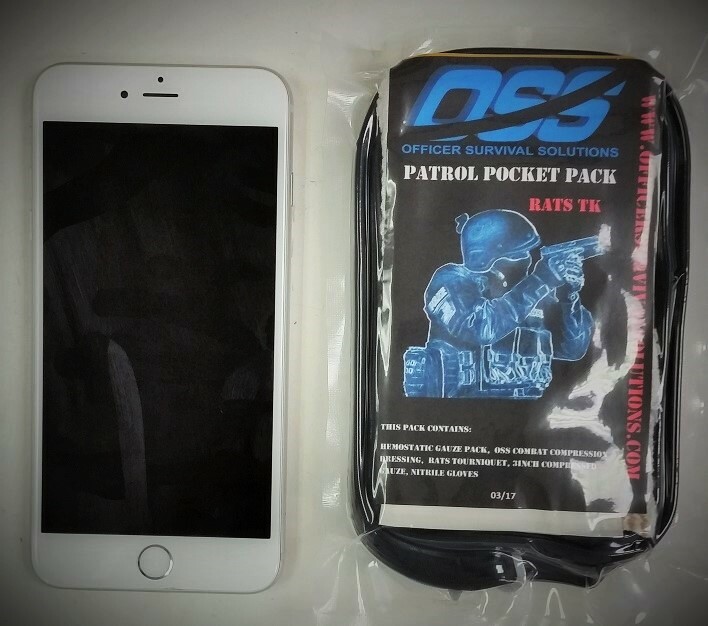 It is specifically designed to be carried "on the officer" and fit inside a standard uniform shirt pocket without being obstructive to everyday patrol operations. At a size of 3x5 and less than half an inch thick, this vital lifesaving pack fits into any uniform shirt breast pocket yet contains all the advanced medical supplies needed to treat any penetrating trauma injury such as: an arterial gunshot or stab wound. This Pocket Pack has the RATS Touirniquet as the primary tourniquet. The RATS Tourniquet has a one handed principle in place when deploying and applying if you only have one hand to use. The pack itself is our specifically designed "skip pack" rugged enough to be skipped, thrown or kicked across a pavement surface to a wounded officer if he/she is inside a hot zone and rescue is not readily available. The Patrol Pocket Pack RT now makes it feasible for every officer to carry a lifesaving kit on their person where it belongs. More than 2/3 of all preventable police officer deaths is due to hemorrhaging (the officer bleeds to death) this pack will have a direct and immediate impact on these sickening statistics. 1-Hemostatic Gauze Pack, 1-OSS Combat Compression Dressing, 1- RATS Tourniquet, 1- 3inch Compressed Gauze, 1-Pair OSS Blue Nitrile Gloves, 1- Tourniquet Field Application Card, all contained in our specifically designed "skip pack"